Photo courtesy of Advocate Good Samaritan Hospital. Advocate Good Samaritan Hospital, an acute-care medical facility in Downers Grove, Illinois, has evolved during the past 30 years from a midsized community hospital to a nationally recognized leader in health care. By leveraging its core competency of building loyal relationships as well as the organizational transformation of "moving from good to great," the hospital has achieved exceptional clinical, service, and financial outcomes. "Good Sam," as it is popularly known, features the highest level of trauma services and perinatal care. Good Samaritan Hospital is part of Advocate Health Care, named one of the 10 top health systems by Thomson Reuters. The hospital has a workforce of 2,700 associates, 450 volunteers, and 950 independent physicians representing 59 specialties. It has revenues of $420 million. Risk-adjusted mortality (actual mortality divided by expected mortality where 1.0 equals the expected) decreased from 0.73 in 2004 to 0.25 in 2010. A brand preference study of Good Samaritan Hospital and its closest competitors ranked Good Samaritan Hospital as the overall most preferred hospital, as well as the top choice for its main service offerings. Good Samaritan Hospital has established a strategic context and vision for a synergistic hospital-physician partnership that has enabled the organization to generate some of the best clinical outcomes in the United States. Overall patient satisfaction levels for outpatient, emergency, ambulatory surgery, and convenient care exceed top decile. Good Samaritan Hospital demonstrates high levels of performance in many process measures for clinical outcomes. Risk-adjusted mortality (actual mortality divided by expected mortality where 1.0 equals the expected) decreased from 0.73 in 2004 to 0.25 in 2010. The Centers for Medicare and Medicaid Services core measure results for pneumonia, heart failure, heart attack, and surgical care are either approaching or exceeding the top-decile level, and meet or exceed the levels of local competitors. In 2003, Good Samaritan Hospital used Six Sigma methodology to pioneer improvement of "door-to-balloon" time, the critical period for assessing and diagnosing a heart attack and delivering the needed intervention. By 2010, the hospital's average door-toballoon time was 52 minutes, among the best in Illinois. The hospital's Cardiac Alert Program has been benchmarked across the country, and the Institute for Healthcare Improvement recognized it as an international best practice. Using Failure Mode and Effects Analysis (FMEA) to identify opportunities to improve processes, Good Samaritan Hospital decreased the ratio of observed to expected postoperative renal failures from 3.0 in 2007 to 0.86 in 2009. Creating an exceptional patient experience is the mission imperative, the ongoing vision, and is at the core of the Good Samaritan culture. Overall patient satisfaction levels at the hospital exceed top-decile ratings from Press Ganey, the largest national surveyor for patient satisfaction, for the following patient segments: outpatient, emergency, ambulatory surgery, and convenient care; the hospital also has achieved top-quartile performance for inpatient satisfaction. Good Samaritan Hospital has established a strategic context and vision for a synergistic hospital-physician partnership that has enabled the organization to generate some of the best clinical outcomes in the United States. A key element of Good Samaritan Hospital's success in advancing clinical excellence and patient safety is its innovative Clinical Integration Program that rewards physicians for achieving superior clinical, service, and efficiency outcomes. Advocate Health Care will use the Clinical Integration Program as the centerpiece of its Accountable Care Organization (AdvocateCare) model in the transition to health care reform. A win-win partnership with physicians has led to breakthrough results in quality, physician satisfaction at the 97th percentile, and an increase in market share of 17 percent from 2006 to 2010. 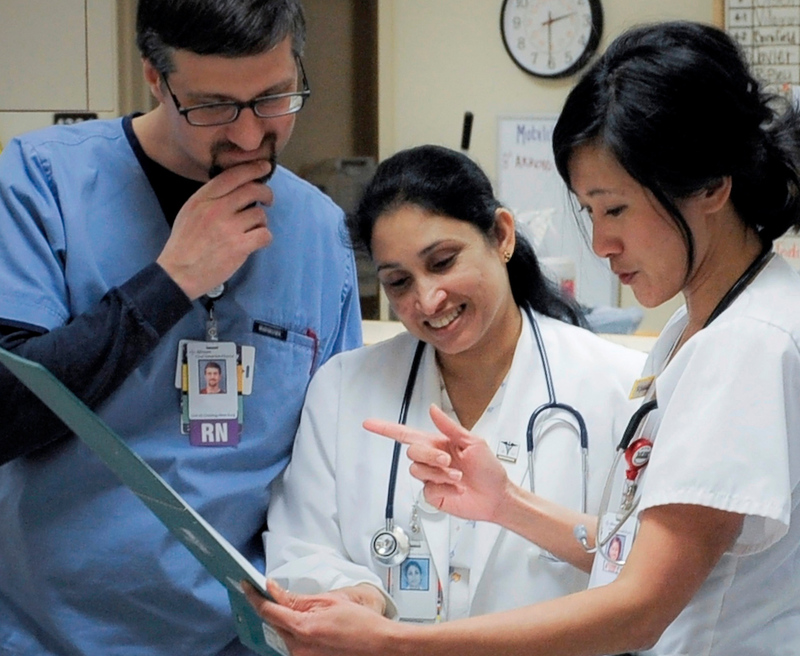 Good Samaritan Hospital uses a 12-step process to determine key factors that affect workforce engagement and satisfaction and then to assess its effectiveness in addressing those factors. The hospital uses the results, which are segmented by job classifications and work units, to determine organizational and department-level tactics for improvement. Survey results from Morehead, an employee opinion research firm, show overall associate satisfaction at the 98th percentile in 2009 and 97th percentile in 2010, both exceeding top decile. A detailed seven-step Performance Management System promotes high performance and engagement through integration with Good Samaritan Hospital's MVP (Mission Values Philosophy), Standards of Behavior, cascaded goals from the strategic plan, and leadership competencies. Leader performance and action plans are managed through a transparent, intranet-based goal performance system. Volunteers are engaged through question-and-review sessions with leaders and an annual seven question survey. Community outreach programs include free wellness services, health fairs, screenings, and lectures throughout the year. Examples include a domestic violence task force; the Why Wait Program offering free mammograms and clinical breast and pelvic exams; support for parents who experience a problematic pregnancy, have a baby with special needs, or have lost a baby; and the Fun with Fitness Program that addresses childhood obesity. Good Samaritan Hospital actively participates in Access DuPage, an innovative community health approach through which Good Samaritan Hospital's physicians provide care to the uninsured population. The hospital provides all diagnostic tests and treatments without charge to Access DuPage patients. Good Samaritan Hospital provided over $10 million in charity care through Access DuPage as a part of its total charity care of $28 million in 2010. With a focus on "funding the future," Good Samaritan Hospital has contributed to Advocate Health Care's system-wide AA rating representing performance in the top 10 percent in the industry. GSMA's net operating margin increased from 5.98 percent in 2007 to 7.79 percent in 2010. As a result of Good Samaritan Hospital's success in creating a culture of patient safety, malpractice insurance expenses declined 83 percent from 2005 to 2010, saving approximately $12 million. Good Samaritan Hospital has become a benchmark for gross days in accounts receivable (AR), reducing the AR cycle from 42 days in 2006 to 32 days in 2009, and generating $66 million in incremental cash.